Some things are just meant to be. The homeowner didn't have any plans to remodel her mater bathroom until the unexpected happened. While the family was on vacation, a pipe burst. Many rooms in the house were flooded and a renovation became a necessity. While driving down Northern Boulevard, the homeowner spotted Showcase Baths, adjacent to its parent company: Showcase Kitchens. 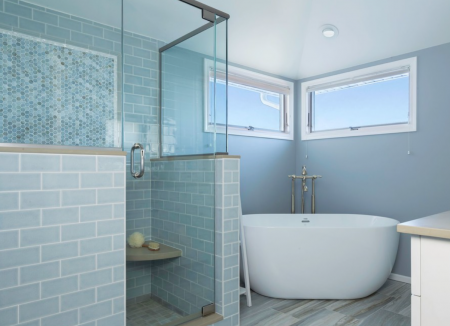 Maria Sergio, the principal designer, worked with the homeowners to create a new master bathroom. She helped them select all the materials including a free-standing Oceana egg-shaped tub and custom made vanity with linen towers. To see more of this room, check us out on Houzz.